A must for those who are not afraid to be different this 2019 calendar shows Ireland in a radical new light. At first glance this is a collection of Irish landscapes deliberately skewed, but their origin runs far deeper than at first apparent. These images cover a journey from the Wild Atlantic Way to Ireland’s Ancient East and are illustrated with sophistication and elegance. 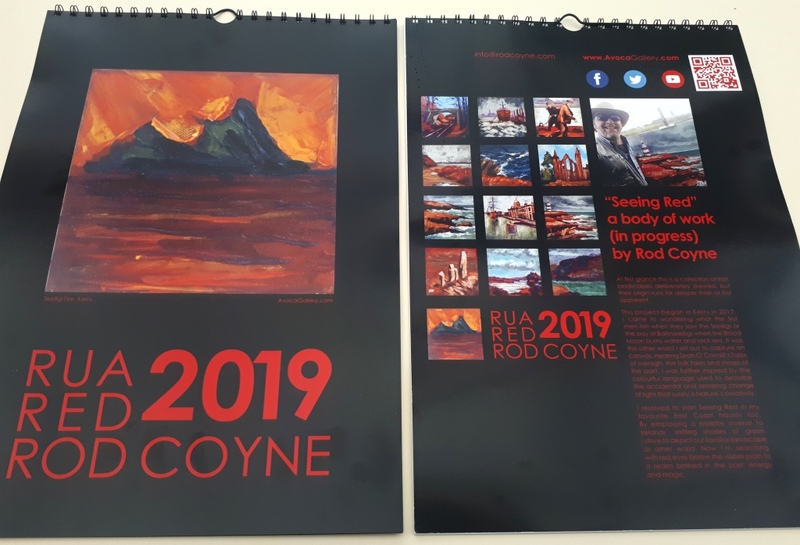 This calendar is A3 in size and features 13 reproductions of Coyne’s favorite recent Red landscapes. Order yours now, or have it shipped directly to friends and family. With delivery included in the price this represents the perfect no-fuss gift for for loved-ones abroad. 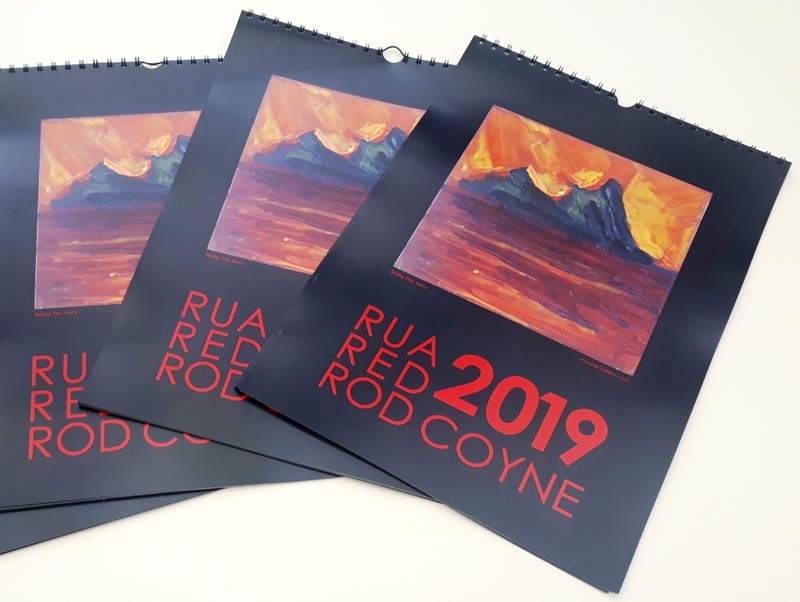 Born out of“Seeing Red” the 2019 Calendar “Rua Red Rod” by Rod Coyne is a totally new departure. At first glance this is a collection of Irish landscapes deliberately skewed, but their origin runs far deeper than at first apparent. “I resolved to start Seeing Red in my favorite east coast haunts too. 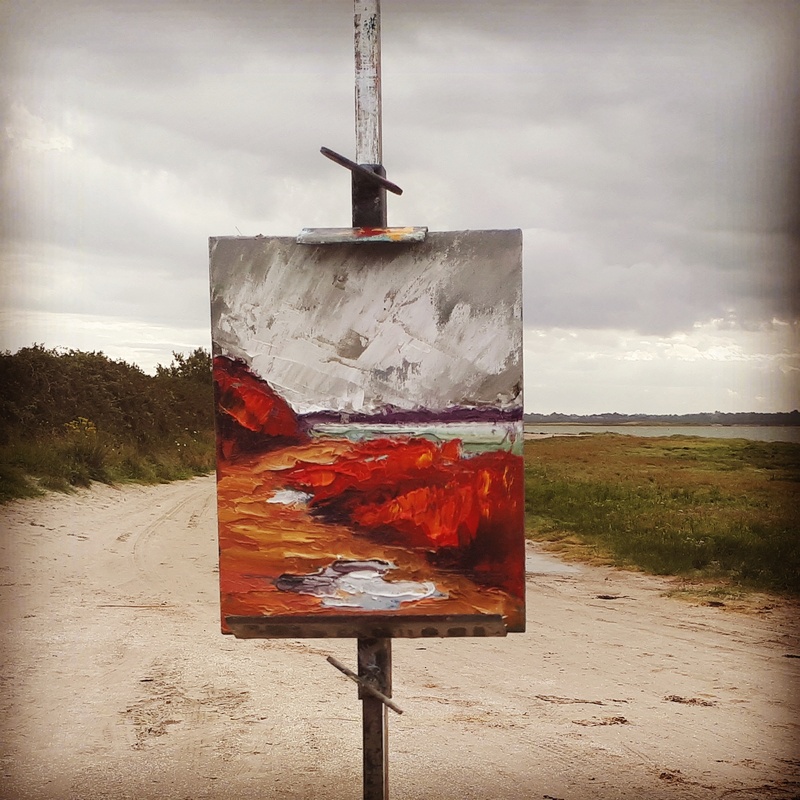 By employing a palette inverse to Irelands’ shifting shades of green I strive to depict our familiar landscape as other world. Now I’m searching with red eyes below the visible plain to a realm bathed in the past, energy and magic.” – Rod Coyne. Ireland’s poetic language provides much inspiration for Coyne’s current work and this makes itself apparent in “Rua Red Rod”. In spoken Gaelic familiar phrases take on an extravagant and dramatic slant adding colour to the verbal depiction. So it is that the viewer is forced to re-see and re-asses everyday scenes depicted through Rod’s alternative view. “While considering the calendar title for 2019 I was having trouble deciding which language to use. 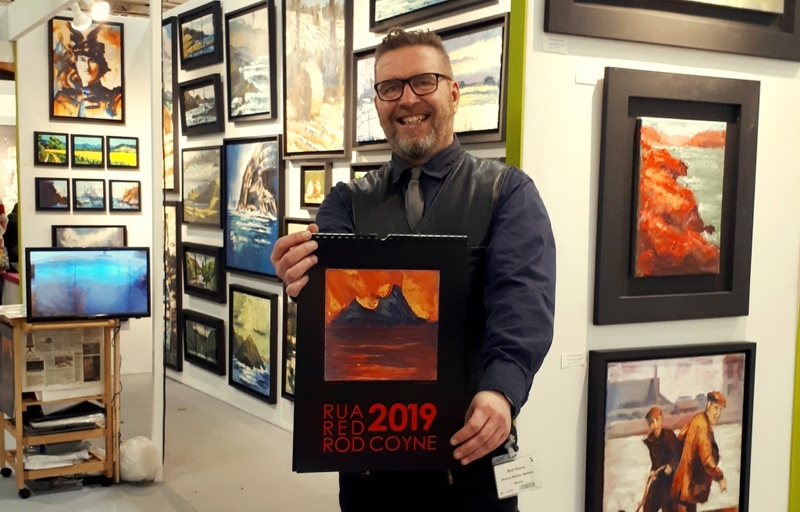 The Irish word for “red” is “rua” and this was as appealing as it was obscure to international customers not in the know. And just using “red” struck me as unimaginative and dull. Not for the first time my muse and graphic designer came up with an elegant solution, Anja was the one that noticed that “rod” is Scandinavian for “red”. So it was that she tied three forms of “red” to a Coyne and a title was born. I should point out that I’m thoroughly taken with Anja’s overall calendar design, I find it sophisticated and elegant.” – Rod Coyne.